The focus of this presentation is on Bluetooth Smart. Bluetooth Smart was called WiBree years ago. Later on it was renamed to Bluetooth Low Energy also called Bluetooth 4.0. Four names for the same technology. Bluetooth Smart is not compatible to the Classic Bluetooth 2.0, 2.1 or 3.0. Nevertheless the Motorola Razr Droid is supporting both – the Classic Bluetooth and the Bluetooth Smart Standard. The iPhone 4S and the iPAD2 are supporting Bluetooth Smart as well. Last but not least several laptops are supporting Bluetooth Smart too. 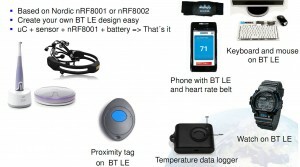 The benefit of Bluetooth Smart is its ultra low power consumption. This is made by a clever power on/off of the transceivers. The Bluetooth Smart Master and the Bluetooth Smart Slave knows each other and power on and off in the same time. The data packages are small and big enough to forward the temperature of your body or your heart rate. With the proximity profile of Bluetooth Smart your key-fob will lock your laptop as soon yo leave your desktop. BTW, a keyboard for your PC will run 10 years on one two AA cells. All mentions examples push a short burst with length of up to 32 bits and go to sleep immediately. The presentation for download shows the differences in communication speed and the differences in the synchronisation between master and slave also. Bluetooth Smard is synchronising much faster. This feature is saving a lot of power too. If you have interest in an own Buetooth Smart (Bluetooth Low Energy)Â solution, a face to face meeting or a local training of your development team,Â then just drop an email to harald.naumann (at) gsm-modem.de or use the form.